Developed in conjunction with Community Emergency Response Teams (CERT) and based on information from FEMA, the CERT All Weather Field Operating Guide is a must have emergency preparedness guide. Printed on all weather Rite in the Rain paper, this book contains 96 pages ( 4 5/8" X 7" spiral book) of pertenent reference information addressing emergency preparedness and emergency situation response. 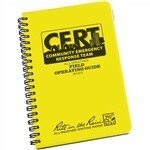 A durable , useful guide for the field or home emergency preparedness.